Use large open-center blocks to draw attention to a beautiful nature print. 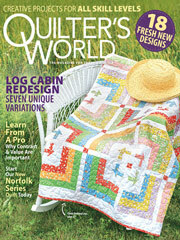 This e-pattern was originally published in the August 2007 issue of Quilter's World magazine. Size: 62 1/2" x 77 1/2".